Afghanistan is a landlocked country in Central Asia. It shares its borders with Pakistan to the southeast, Iran to west, Turkmenistan, Uzbekistan, and Tajikistan to the north, and China to the northeast. Afghanistan's earliest inhabitants may have lived over 50,000 years ago. Some of the early known civilizations in the region were the Achaemenid, Macedonian, and the Mauryan Empires. The Achaemenid Empire had taken control of the region that includes modern Afghanistan by the 6th century BC, until it was conquered and occupied by Alexander the Great around 330 BC. That occupation was followed by the rule of the Seleucid Empire before it became part of the Maurya Empire in 305 BC. Over the next centuries, due to Afghanistan's strategic location within Asia, various empires successively took control of the region, including the Parthians, Kushans, and Sassanids. The country came to be known as Khorasan by the 4th century CE. Islam spread to the country in 342 and it became an important center for Islam. However, the Mongols, led by Genghis Khan, invaded the country in 1219, causing major destruction. Between the 16th and the 18th centuries, three kingdoms ruled the region: the Khanate of Bukhara, the Mughals, and the Safavids, who soon dominated most of the region. In 1709, Mir Wais Hotak led a revolution against the Persian Safavids and declared Afghanistan independent. The Afghan Empire worked towards stability over the next century. They fought British intrusion in Anglo-Afghan Wars in the 1840s to 1870s, with the British controlling some areas until Afghanistan was declared independent under the Treaty of Rawalpindi in 1919. The country was ruled by a series of kings until 1973 when a coup allowed Daoud Khan to take control of the government as the president. A few years later, in the Saur Revolution of 1978, the People's Democratic Party arose to take control of the government, and a civil war broke out. The United States stepped in to support the mujahideen, and the Soviet Union became involved as well and invaded Afghanistan in 1979. The war with the Soviets, which resulted in massive death and destruction, lasted 10 years. The Soviets finally withdrew in 1989. Even after their withdrawal, Afghanistan faced foreign intrusions and soon witnessed the rise of the Taliban, who took control of Kabul in 1996. In October 2001, U.S.-led bombing of Afghanistan began after the September 11 attacks on the United States. In December 2001, Hamid Karzai was sworn in as head of an interim power-sharing government. In September 2005, Afghans voted in the first parliamentary elections in more than 30 years. In October 2009, Karzai was declared winner of August presidential election. This came after Abdullah Abdullah, a second-placed opponent, pulled out before the second round. In 2011, President Karzai made the first official state visit to Russia. This was the first visit to Russia by an Afghan leader since the end of the Soviet invasion in 1989. Afghanistan shares borders with Pakistan, Iran, Turkmenistan, Uzbekistan, Tajikistan, and China. Afghanistan is located in Central Asia, and is entirely landlocked. 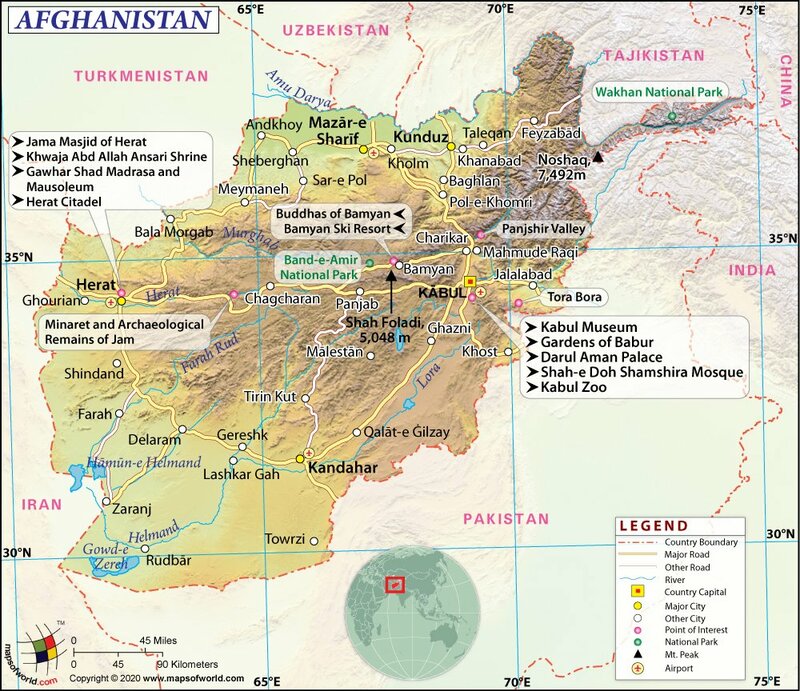 Geographic features of Afghanistan include the Hindu Kush and Pamir Mountains, the Himalayas, and Central Highlands, plateau in the southwest, and plains in the north. Afghanistan's highest point is at Noshaq, which stands 7,492 meters (24,580 feet) above sea level in the Hindu Kush Mountains near China. The northern plains include the fertile river valley. Major rivers in Afghanistan include the Kabul, Helmand, Amu Darya, Kunduz, and Arghandab Rivers. Afghanistan is a country with a long history and a vibrant culture, with influences from Persian as well as many other cultures. However, many regions of Afghanistan remain unsafe for foreign travelers, as they are controlled by rebel forces. The capital, Kabul, was damaged during the recent wars, but is in the process of redevelopment. Some of the sites in Kabul include the Darul Aman Palace, which was built by King Amanullah in the 1920s; the Gardens of Babur, which is a scenic destination with a pool, museum, and mosque, and several other museums around the city. There are also a few other parks, including Bagh-e Bala, which includes a former palace, and Bagh-e Zanana, which is for women and children only. Outside the capital, other sites include Band-e Amir National Point, in which there are beautiful lakes, and hiking areas including the Panjshir Valley and the Salang Pass. Bamiyan is one of the most important destinations in Afghanistan. The Bamiyan Buddha statues were carved into the cliffs of the mountains, though they are in ruins due to Taliban destruction. The main point of entry in Afghanistan is the capital's Kabul International Airport (Khwaja Rawash Airport), which serves destinations around the Middle East and Asia, with many flights to Delhi. There are also airports in the north, like Maulana Jalaluddin Balkhi International, in Kandahar, and Bagram. There are roads that lead into Afghanistan from Pakistan, Iran, Uzbekistan, and Tajikistan, though they are currently unsafe for travelers. There are also buses from Pakistan and Iran. In cities, there is some public transportation available such as buses, minibuses, and taxis. Buzkashi is a traditional sport of Afghanistan. Meaning goat dragging, the sport is played on horse-back and involves players trying to drag a goat or calf carcass towards a goal. Nawroz, which is the New Year in Afghanistan, is celebrated on March 21. Ahmad Shāh Durrānī is regarded as the founder of the modern state of Afghanistan. Why did Soviet Union Invade Afghanistan? Is Pakistan a Terrorist State? Can Afghanistan be Visited for Tourism?